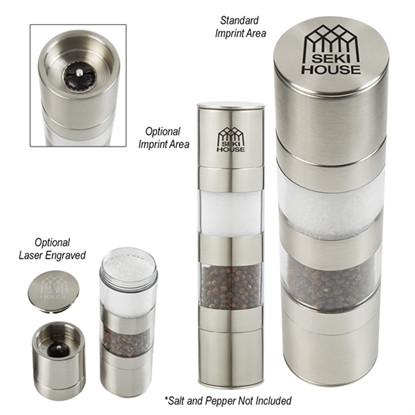 Season your food with fresh ingredients using this salt and pepper grinder! This handy kitchen tool is made from stainless steel and has an easy-to-use twist design. The dual chambers with end caps help eliminate mess and keeps dust out. Ideal for any restaurant or home kitchen, it can be customized with a imprint of your company name and logo for maximum brand exposure! 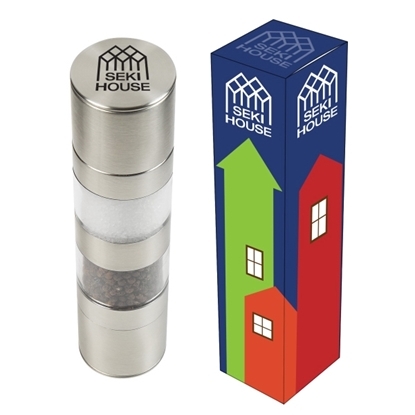 Add a bit of spice to your marketing campaign with this salt and pepper mill! It will spruce up the table setting with its sophisticated design and comes in a gift box that can feature your company artwork with our four color process. The item itself can be imprinted in one color / one location. If you're attending a food conference it's good to have some seasoning on hand. It's even better if your clients can take an item like this home! Mypromotionalpens.com offers the largest and best priced selection in Promotional Salt & Pepper Shakers And Mills. We will price compete and we won't be under sold. Let our graphic designers make your personalized Salt & Pepper Shakers And Mills standout above the crowd at no charge. We won't stop until you are completely satisfied with your custom Salt & Pepper Shakers And Mills art proof.Use category search filters on your left to help narrow your search to find exactly what you are looking for.